The location offers many possibilities of day trips and activities, from trekking and montain biking to cultural tours, passing through shopping and water sports at the Lake. Villa Giotto is an authentic Renaissance villa, located at Vicchio, in the region of Mugello, the gentle hilly area North of Florence. This area is very special, not only because of its sweet rolling landscape, but also because of the presence of many Renaissance Villas built during the Granducky of Tuscany, when the Florentine families were on the top of their influence on the development of science and arts. This villa has a long and interesting history, and the recent restoration has not only preserved but also enhanced its majesty. 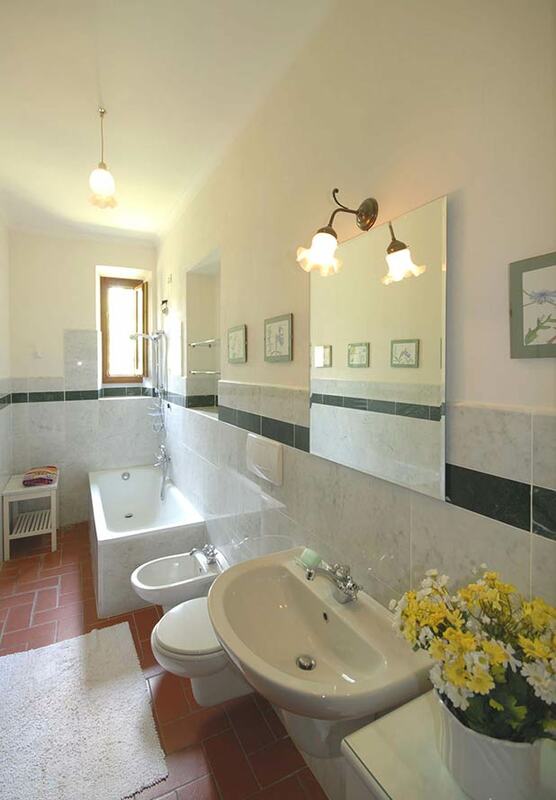 The villa offers a great chance to experience the real Tuscan atmosphere, of culture and countryside. In fact, the villa used to be not only a summer residence for the family also a producing property, especially of wine. The original wine cellars, stables, bakery and other work premises have been preserved and can be visited by guests. The villa is private for the only use of guests, with a wide surrounding park and private swimming pool. The private property is totally fenced in. The villa is located less than 3 km from the village of Vicchio, the birth place of two great Tuscan artists: Giotto and Beaton Angelico. The original house of Giotto, monuments, museums and art galleries can be visited in the surroundings. Besides, you find within convenient distance many good restaurants, cafes where to have a morning cappuccino and all kind of shops. The villa is composed of two floors, with in total three rooms, kitchen, 7 bedrooms and 6 bathrooms. The main entrance opens to a really wide reception hall which gives access to a charming living room, a noble dining room and the fully equipped kitchen. The living room presents a typical Renaissance style environment, with authentic pieces of furniture, open fireplace, comfortable sofas and armchairs and the well-preserved original lacunar ceiling which is an art work itself. The same for the dining room, with its decorated wooden lacunar ceiling, typical from the late Renaissance. The dining room is very wide, with a charming fireplace and two large windows receiving the natural light from the garden that enhances the beauty of each detail. Two SAT-TVs are available in the villa and a land line telephone and fax service. The eat-in kitchen offers all necessary equipments to prepare all kinds of menus, with stove, oven, refrigerator, freezer, microwave, dishwasher, double sink, a large wooden table in the centre and all necessary kitchen ware. If you prefer not to cook, you can hire the villa’s cook to come in the house and prepare a delicious Tuscan meal for the whole group, upon request. Besides, the villa is equipped with a washing machine available for the use of guests, and in case would be necessary, it is possible to arrange a housekeeping service, paid extra upon request. The villa offers 4 mountain bikes free of charge for use of guests. Pets are permitted, with an extra cost and to be approved by the owner (please inform us when doing the booking). The villa enjoys of a stunning panorama, specially from the open terrace accessed by the living room, where is located a gazebo with table and chairs where to have meals al fresco or just stay for a chat with friends, to enjoy a glass of Chianti wine and admire the views of the hilly green area. The ground floor holds both 3 bedrooms and 2 full bathrooms, among them: two bedrooms are furnished with twin beds and one with a queen sized antique bed. Each one of the bedrooms is really spacious, with two windows each, and enough space for antique pieces of furniture and a sitting or reading area. The three bedrooms share two bathrooms on the ground floor: one of them fully equipped with a shower, WC, bidet and sink, and the second and largest, with a bathtub, a separate shower box, WC, bidet and sink. 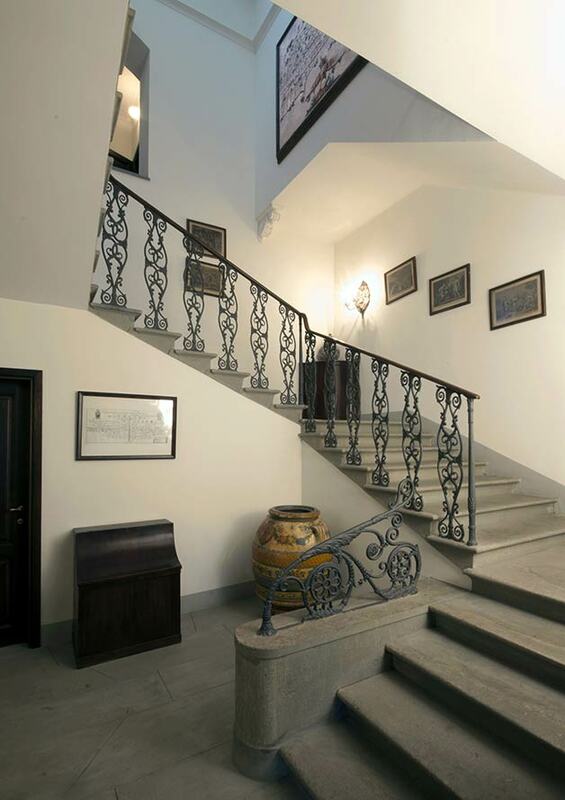 The typical stone staircase leads up to the first floor, where are located a charming living room with balcony that gives access to 4 bedrooms all with en-suite bathrooms. Two bedrooms are furnished with queen sized double beds and one of them opens to a charming balcony. The bedrooms are very spacious with enough room for the owner’s collection of antique pieces of furniture like decorated wardrobes, chests of drawers, desks, bookcases and much more. The sizes of beds are not standard because they are antique handcraft, some of decorated wood, some of wrought iron. Mattresses, pillows and bed linen are brand new and the best quality. Two of the first floor bedrooms are furnished with twin beds. Among the bathrooms, all en-suite, one of them is equipped with a bathtub, hand held shower, WC, sink and bidet, and the other three bathrooms have a regular shower each instead of the bathtub. The surrounding garden offers many spots where to relax on the cosy garden chairs, among cypress trees, flowers and colourful local plants. There is even a grotto (a water basin with a cascade) typical for the late Renaissance gardens. The garden is fenced in; the access to the villa is made through an iron gate and the charming pathway that leads to the main entrance. Immersed in the green garden is located the private pool, with 12 x 5 metres, surrounded by a solarium with sun loungers, table and chairs. The location is perfect for day-trips in Tuscany and much more: Florence is located within 35 km, the outlet shopping centre Barberino Designer, that recreates a typical Renaissance village, is distant only 26 km, close to the highway that can lead you easily to Bologna, Rome, Pisa and much more. In the vicinities the village of Vicchio offers many interesting choices, like a visit to the house of Giotto. Wine tours, horseback riding (5 km) and a golf course (18km) are also available. 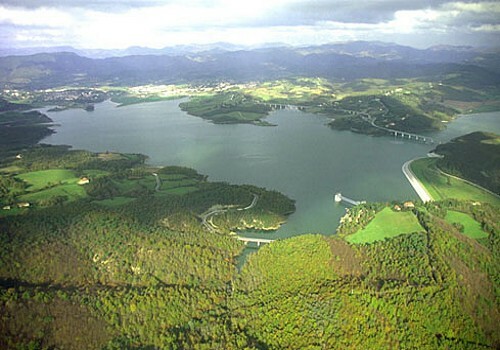 Besides, the villa is close to the Lake of Bilancino (20 km), where many facilities have been built on its borders. 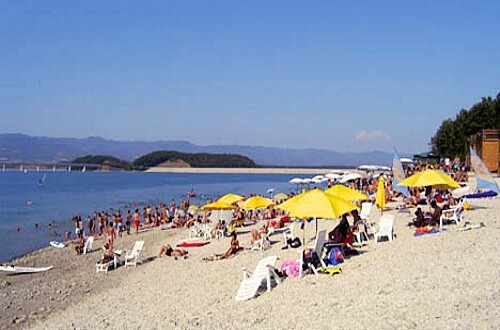 You will find a beach with many restaurants; cafes and bathing establishments offer umbrellas and sun loungers. Many water activities are available, like sailing and windsurfing. 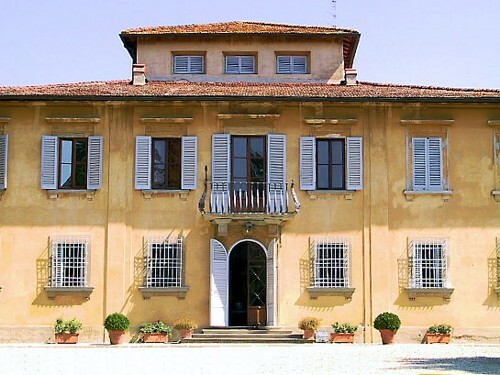 Close by you find the nicest Medici Villas and historic castles to visit. 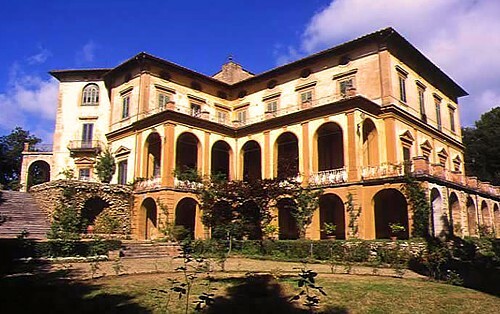 Villa STRIANO is maybe the most stunning symbol of medieval aristocratic lifestyle. Words do not come to my mind, they live in my heart where I will keep them forever. Thank you again for letting us enjoy the blessing of Villa Giotto. Our whole family had a wonderful time. The Villa Giotto exceeded our expectations in every way, from our first view of the house as we drove through the gate. ‘Grazie’ for giving our family such an incredible place to reflect, play, celebrate and experience Tuscany! We all feel renewed, both physically and spiritually. We will never forget this and we will return! ‘Arrivederci’! Thank you very much for letting us stay in Villa Giotto for the last two weeks. We have had a wonderful time and really appreciated and respected your personal attention to our stay. The house and your family have such a remarkable history which has impressed us no end. Toscane is a fantastic area to be and we love to be here again.